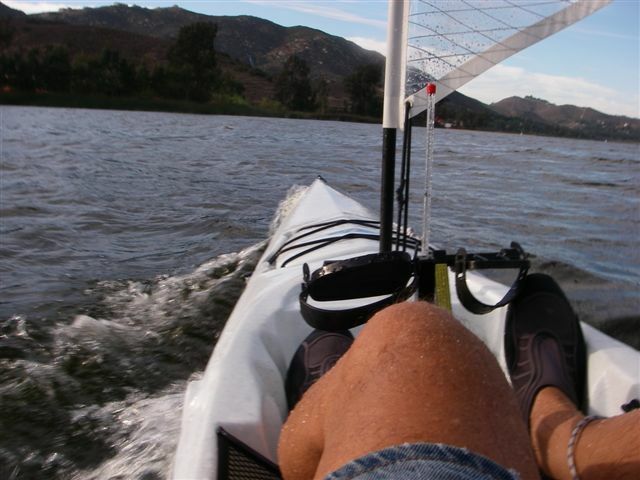 Hobie Forums • View topic - Revolution / Adventure Island versitlity? Post subject: Revolution / Adventure Island versitlity? Hello, my name is Adam and I am new to this forum. So I'm new to kayaking but have been racing sail boats for over 10 years. 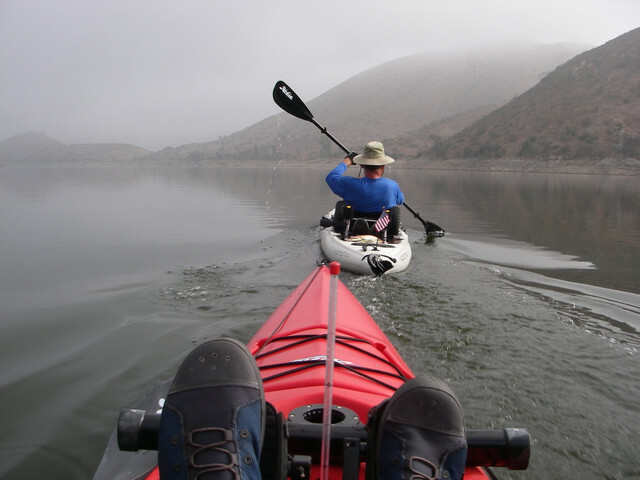 I'm am interested in kayaking for exercise and the simplicity of getting out on the water. 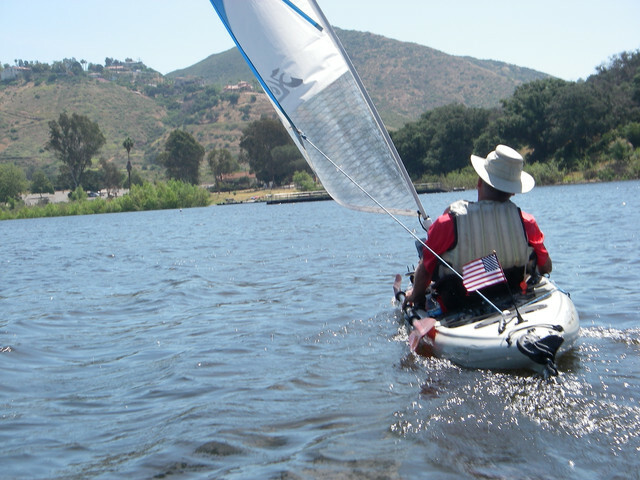 I am drawn to the Hobie kayaks for the versatility of paddling, peddling and sailing. So my question is for those of you with experience with the Revolution kayak or the Adventure Island, what is the percentage of time that you are paddleing, paddleing and sailing? I'm guessing those of you with the A I mainly sail or peddle but can it be paddled? And for those of you with the Revolution, is sailing somthing worthwhile for this kayak or is better suited for just paddleing / peddling? Post subject: Re: Revolution / Adventure Island versitlity? sail 95%, peddle 5%, paddle 0%. I don't think my hobie supplied paddles have even touched the water. The mirage drive is just so much more efficient than paddles. I've stripped my TI down to just kayak mode once. It was quite capable as just a kayak. The older AI's were basically an adventure with the added sail, amas and akas. The newer AI is more geared towards the sailing aspect. So it has a little higher free board, is a little heavier and the amas have more flotation. Basically if you went with an AI and decided to strip it down to kayak and peddle/paddle I don't think you would be disappointed. Revolutions are not easy to paddle, even the revo 16 or single hull adventure requires good kayaking skills as you need to be able to paddle a long kayak without rudder, as it is hand operated (designed for pedals). My ratio of pedal and paddle for revo 16 is about 50/50. Pedalling is way easier and so you are more likely to default to it. If you want to sail go directly to AI if its in your budget, or you will wish you had if you do a compromise. The AI works great as a kayak. 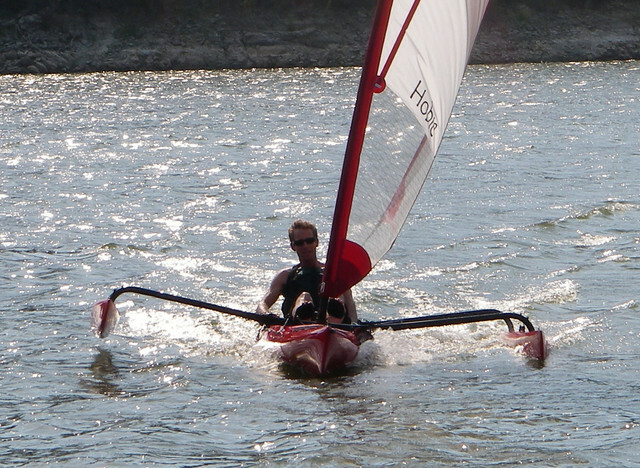 It's probably the most fun to sail -- feels fast, very stable and there is a class association if you want to race. mode. It takes about 15 minutes to assemble if you tote it in pieces (on a roof rack for instance) so it takes a little longer to get on the water. The nice thing about the kayak line is you can carry your sail and set it up or break down on the water. There is a furling kit available and sailing while pedaling gives you 360 degree capability while getting exercise. They're not particularly fast sailers -- maybe up to 5 MPH depending on wind, chop and skill, but still fun to sail. In the second pic, this guy is paddling while pedaling and getting a great work out. He is being followed by an early AI in the kayak mode. The secret to tracking with the Hobies is to put the rudder down and have it properly tuned. Even the squirrelly Revo 11 is steady as a clock with the sailing rudder deployed. Otherwise, as WAVERIDER says, they are not good trackers. Whereas the Revo 16 is the fastest, smoothest and best in bad weather, the Revo 13 is probably best all around and the Revo 11 is the most maneuverable. Any of them will give you the ability to get a good workout, sail or just cruise. 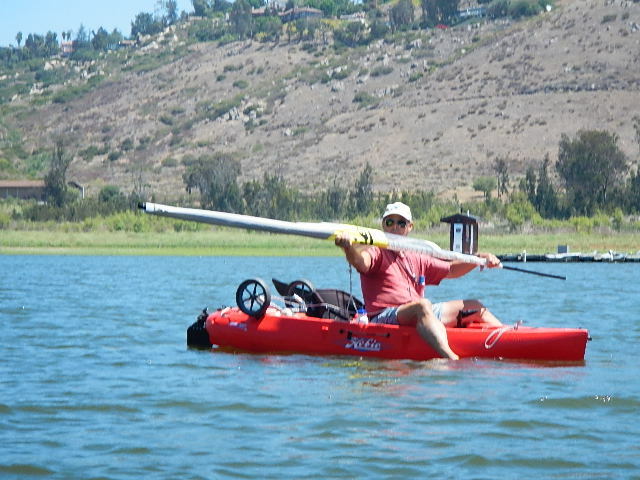 I have AI (which I use as a sailing kayak as well as a trimaran) and Oasis and have owned Adventure (Revo 16), Outback and Outfitter and have many years of kayaking and kayak sailing on all of them. The AI is the fastest sailer by a country mile but it quickly becomes a very wet ride as the speed increases (an important consideration in cold weather/water) and there is none of the leaning of a monohull so I do not find it much of a sailing challenge. I rarely use mine as a trimaran but I do use it as such when I want to sail a long way, the rest of the time I use it as a monohull kayak/sailer. As has been pointed out - it is much more of a proposition to cart around and set up than the monohull kayak. The Revo 16 is the best sailer of the monohulls because of the daggerboard. It sails well on all points but if you are expecting a lot of speed you will be disappointed; that said, it is a very engaging sailing experience because you are in intimate contact with the elements in such a tiny low-slung sailboat and it provides the exact same sailing experience as a full-sized sailboat. 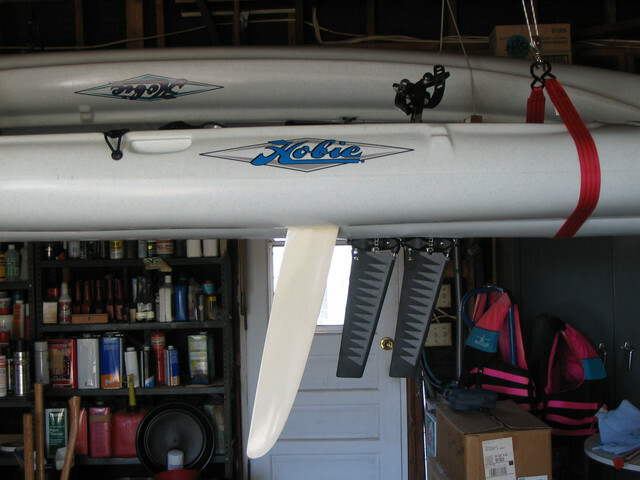 I totally LOVE sailing my AI kayak (in monohull configuration) which I do using the small Hobie sail & mast via an adapter I made (easily and cheaply) that fits into the AI mast receiver (which is different from and much larger than the 'normal' kayak mast receiver). I never paddle my Hobies (other than to go out from shore and/or reverse) out of preference; that's because the pedal drive is just sooo much better. However I always take the sail with me and I nearly always use it because I just need a sailing fix and the Hobie provides it. 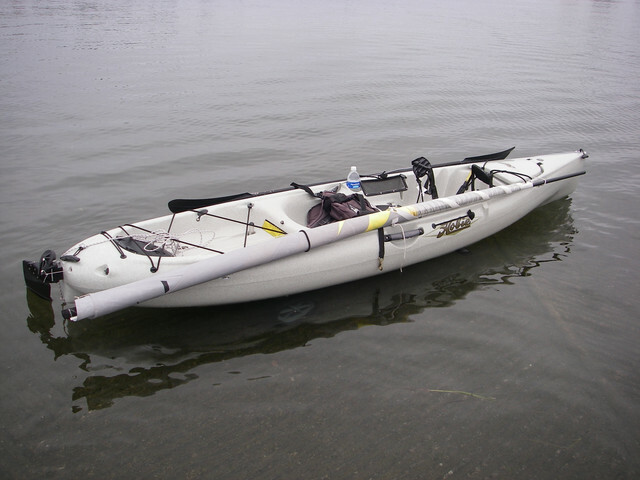 I have a sailing boat and a motorboat at my beach house but the kayak is the thing that I use the most by a long, long margin because it is just so quick and easy: pull the kayak out of the garage where it waits on its cart, set it up in 5 minutes and go. If you want to find out about the adapter I made and some of my other sailing enhancements have a dig around on the forum - there's lots of info from me and others here! Whatever you decide, if other peoples' experience (mine included) is anything to go by, you will have a great time: these boats are the best watertoys I have ever owned (and I have owned 'a few'!) and the support from the manufacturer and the wider owner-community is second to none! Thanks so much for your insight and experience. It sounds like the revolution 16 might be my best bet for the paddleing, peddling and sailing experience. I'm fortunate to have a kayak center / hobie dealer not far from my home. They have the AI for rent as well as the revolution models. So I'll be going there this week and bringing up some of your points with the sales staff. One question I do have since there was a photo of the revo 16 sailing without sidekicks , is it stable enough to do so or is it reccomended to have the sidekicks for a newbie? You can sail a revo 16 without amas sidekicks as long as you have the daggerboard. Much harder to do on the other hobies as they have no daggerboard. Kayaks are not as beamy as most small sailboats so they can be a little tender. Whether or not you get a "Sidekick" will depend on prevailing winds locally, water temperature, your small boat sailing skills and your sense of adventure. I sail the Revo 16 without a Sidekick and obviously the guy in the pic does too. I capsized the first time out with an accidental jibe from a sudden wind shift. That was several years ago, but you have to pay attention. The Sidekick makes for a more relaxing sail, especially in moderate winds and gusts. It helps to keep your seat in the low position! To sail, you need a sailing rudder in addition to the sailing kit. A daggerboard is definitely a plus. You can add a furler later if you want to -- there are also some custom made versions on the forum here. There are some simple rigging mods that make sailing more responsive and easier. They will probably make more sense after your first sailing experience though. How about a sticky FAQ thread for rigging mods? The Revo 16 daggerboard certainly makes the boat more stable and I rarely if ever sail mine without it but it definitely can be done: none of the other Hobie kayaks has a daggerboard so they all sail without one - unless an aftermarket addition - and loads of people sail them (hats off to you if you do!). But if you already know how a sailboat works (which it appears you do) you will quickly get a feel for how far you can push them - not all that far in reality but as you gain confidence and experience you will learn where the limits are. As you know, it is all down to wind strength, your ability to shift your weight around, your ability to react and how disinclined you are to risk a ducking. Anyway, I am waffling on - you should be fine without stabilisers as long as you take a conservative approach - but the daggerboard represents a step-change in the Revo 16's sailing capabilities over the other bats in the fleet. Not forgetting of course as i fish from it I spend a lot of time stationary being occupied by other activities so it adds primary stability in those cases, especially when you have the drive pulled and so dont have fins to stabalise it. Also slows down side drift when drift fishing without turning kayak as having the rudder deployed would. Doesnt have kick up design, but then it only hangs down about 300mm and is a loose fit so tends to pop up if you forget to pull it when it shoals when beaching. I have had a Revolution 13 for many years and finally got a sail about a year ago. I often go exploring rugged coastlines, I use the sail to get their (often a few km) and then use the peddles, resorting to the paddles only if I get into a tricky situation where in need to manoeuver tightly amongst rocks etc. I found I typically nolong use the AMAs anymore but often have to furl the sail because where I live is quite windy. The sail has also extended my range as it reduces the peddling effort a lot and helped stabilise the kayak in rough water. You also end up peddling when there is no wind or its in the wrong direction.